Brussels Sprouts are probably one of the most misunderstood vegetables out there. Start with the spelling: B-R-U-S-S-E-L-S SP-R-O-U-T-S . . . Brussels . . . really? There is really an “S” at the end of “Brussel! Anyway, now that you’ve have your daily dose of spelling instruction let’s get on to it: Roasting vegetables is great way to unlock a great flavor of vegetables that most other ways of preparation won’t. 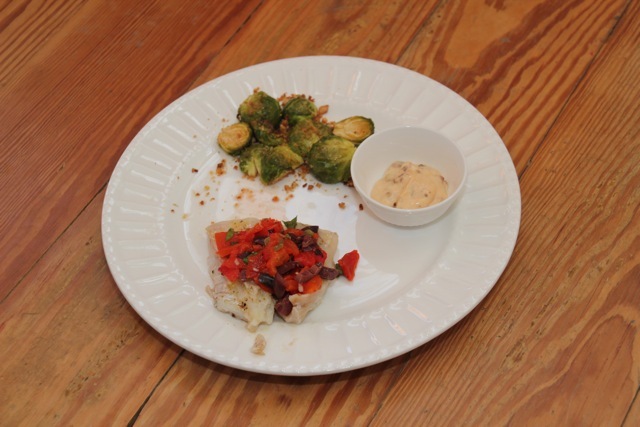 I have run into very few people who tell me they like Brussels sprouts at the beginning of one of my cooking classes. I have also run into very few people after my cooking classes who don’t like roasted Brussels sprouts. Even the most simple roasting with olive oil and, seasoned salt and pepper is fantastic! 1. Preheat oven to 400 degrees. Cut Brussels sprouts in half. Transfer sprouts to a large bowl and drizzle with 1 tablespoon lemon juice and oil; set aside. 3. On a rimmed baking sheet, spread sprouts-crumb mixture in an even layer. 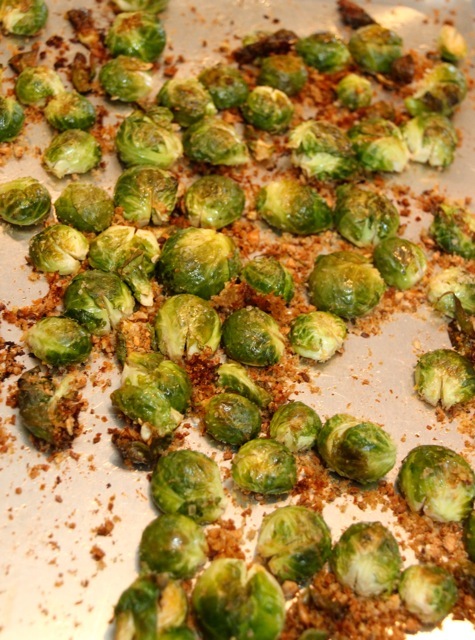 Transfer to oven and roast for 10 minutes; remove from oven and use tongs to quickly turn sprouts over. Return to oven and bake until tender, 7 to 10 minutes. 4. Meanwhile, prepare aioli: in a small bowl, combine mayonnaise, remaining 1 tablespoon lemon juice, remaining 1 teaspoon lemon zest, chipotle chile and reserved adobo sauce; mix well. Remove sprouts from oven and place on a large serving platter. To sprouts with any remaining bread crumbs from baking sheet and serve aioli on the side for dipping. #Nutritional Bonus: Glucosinolates are found largely in Brussels sprouts, as they are in all cruciferous vegetables like greens, cabbage, cauliflower and broccoli. However, Brussels sprouts contain a special combination of glucosinolates that are believed to be extra beneficial to the development of cancer risk reducing compounds in the body. 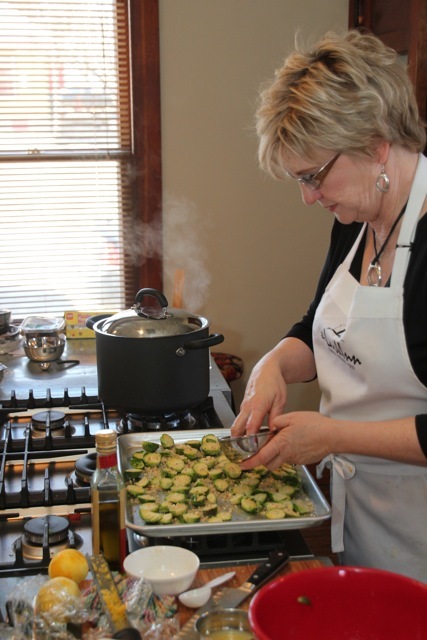 For more information about Kris Larkin or her gourmet cooking classes in the picturesque Flint Hills of Kansas visit her website. This entry was posted on January 20, 2012, 7:40 am and is filed under Cooking and Baking. You can follow any responses to this entry through RSS 2.0. You can leave a response, or trackback from your own site. As a longtime Brussels sprouts lover, I’m shocked to realize I’ve been missing its extra “s” this whole time! This recipe looks delicious, I just wish they weren’t so expensive this time of year. I may need to start my own Brussels sprouts garden. It’s not my first time to pay a visit this web site, i am visiting this site dailly and take good facts from here everyday.